Unfortunately, the dress you are looking for (Style: DQ-3039b, Name: DQ-3039b) is no longer available. This short homecoming dress with shimmering beadwork and gleaming satin offers an eye-catching option for your semi-formal event. Rhinestones with tonal beading swirl across the v-neck fitted bodice, while double thin beaded straps drape over the shoulders and open back for a sultry look. Pleated at the natural waistline, the short satin skirt has a tulle and satin lining that adds a flirty flair. 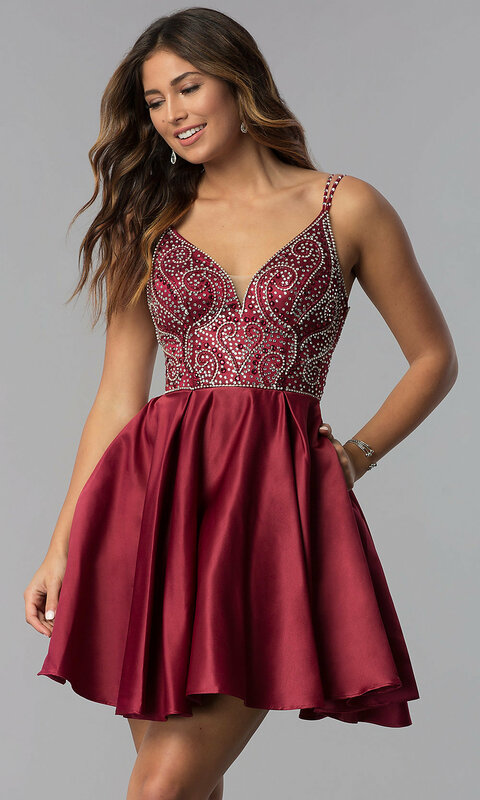 Available in misses and plus sizes for sweet-sixteen celebrations, hoco 2019 parties, and wedding receptions, this dazzling short homecoming dress, under $150, proves that you don't have to spend a fortune for quality fashion.